Compass Pools are expert swimming pool builders with many years of experience designing and installing pools in homes across the UK. We are based in West Sussex but we serve almost anywhere in the country from Kent and Wiltshire up to Manchester and beyond. We have developed a reputation for quality and professionalism – you can rest assured you are working with some of the finest swimming pool constructors in the country. It is always our aim to exceed your expectations. We work with you at all stages the project, consulting throughout the design stage and working within your brief and requirements to create a pool that is perfect for you. We are purely a pool contractor, meaning we have the specialist skills and experience to complete any kind of construction you need. Having a swimming pool built can be a large financial and time commitment. That means it’s absolutely vital that you choose the right team to get the job done. No matter what kind of pool you are planning to have installed, your selected swimming pool builders must know exactly what they are doing during each step of the process, or you may be disappointed with the outcome of your project. Whether you want a custom in-ground pool or a one-piece pool, choose a company with skills and experience as well as the references to back it up. Many pool builders specialise in specific pool types, while others have a broad experience with different types of constructions. Even if you have selected a simple swimming pool design that does not involve a complicated construction process, it is very important to hire a team with experience in creating the kind of pool that you are looking for. It’s also worth noting that you should not allow any kind of building work to begin until you have agreed on the final design. Once the foundations have been set it can become almost impossible to add certain features to the pool – so if you are considering a custom design make sure that everything has been mapped out. Compass Pools have the expertise to work on a huge range of swimming pool projects, and we have built up a track record of satisfied homeowners. What makes Compass Pools different from other pool builders? Unlike the majority of pool builders, Compass Pools does not use concrete. Our pools utilise our patented carbon ceramic composite technology and are delivered to your property in one piece. Offering fantastic strength and insulation, our pools are typically much faster to install than standard pools, as the one-piece shell can be simply placed in a previously excavated hole. We have highly experienced and knowledgeable contractors working across the UK, so we can build your pool no matter where you are based. Whether your pool requires planning permission will depend on a large number of factors – however, in the majority of cases, an outdoor pool does not require planning permission. Some of the reasons you might need permission include if the pool will take up more than 50% of the garden, if the property is a listed building, if the pool will be overlooked by a public area or if the pool will be located in a conservation area. We would be happy to provide you with further advice and information to help you with any planning permission concerns that you may have. What size pool should I choose? We would always recommend choosing a pool size and shape that is most appropriate for the shape of your garden. A larger pool might be preferable but it will also mean higher running costs, and you also may need to take into account the depth most suitable for the pool if you have children – for example, the minimum water depth for most swimming strokes in 1.1m, but the minimum depth for a shallow dive is 1.5m. If the pool is sensible to the size of the property it can add a great deal of value to your home as well as a being a fantastic feature for your family to enjoy. We offer a wide range of pool sizes and styles to suit every taste and requirement. What ongoing maintenance will I need to carry out? All swimming pools require ongoing maintenance to ensure that they perform their best, so it is important to be aware of what you need to do to keep your pool in top condition. Firstly, chemical levels need to be monitored and maintained to keep the water safe and clean to swim in – too low and bacteria can start to grow, too high and the water can be damaging for your skin. What access is required for construction? 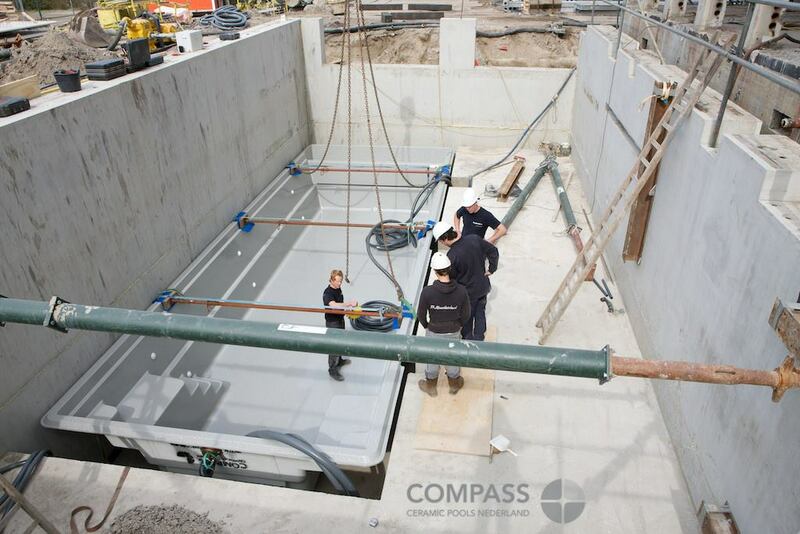 Due to the way that we install Compass Pools, we need have access in order to lift or crane the main one-piece pool shell into place. We also need to carry out the groundworks and excavation of the hole, so access would be required for this – however, it is often easier than you expect to get the machinery into your garden to carry out the work. Please talk to us about the kind of space that we need to work within to build your pool.